The photo was taken on the Boulevard de Temple, in a fashionable neighbourhood full of boutiques, cafes and theatres. It was also known at the time as the ‘Boulevard du Crime’ due to the crime melodramas performed every evening in the local theatres. The photo portrays the road as deserted, apart from a small figure having his boots shined on the pavement in the bottom left hand corner. However, in reality, the boulevard was far from empty. The exposure time for this early form of photography was around seven minutes, meaning that moving objects could not be captured. In this busy area, there would have been plentiful traffic of horse-drawn carriages and wandering pedestrians but none of them stayed still long enough to be registered. The man getting his boots polished however stayed in the same position for at least seven minutes - and inadvertently became the first human to be photographed. The shoe-shiner himself is also visible but not as clearly. 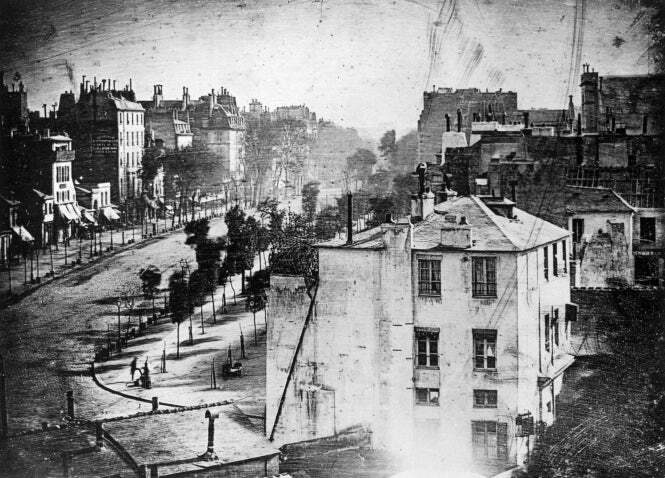 The photo was taken by Louis Daguerre, a pioneer in the photography industry and the inventor of the self-named daguerreotype, a method of photography whereby the image is produced on a silver-covered copperplate. After being introduced in 1839, this technique remained the most commonly used for nearly 20 years. In that same year, the photographer is quoted as saying “I have seized the light. I have arrested its flight.” Daguerre went on to be considered one of the fathers of photography, and is one of the 72 names inscribed on the Eiffel Tower. One of his partners, Joseph Nicéphore Niépce, took the earliest known existing photograph in 1826 or 1827 – a view of his estate in Burgundy from an upstairs window, using a silver and chalk mixture that darkened when exposed to light. This year’s Salon de la Photo is being held on November 5-9 at the Parc des Expositions at Porte de Versailles, bringing together the most influential associations and individuals in the photography industry. It is an event for both photographers and photography enthusiasts alike, offering a selection of lessons, discussions and workshops. General admission is €11.